BRIDE Dubai 2019, the Middle East’s premier wedding and lifestyle event, is back for its 22nd year, with more than 150 local, regional and international exhibitors showcasing from February 6 to 9 at Dubai World Trade Centre. The most discerning brides-to-be and lifestyle-savvy women can expect a wealth of educational, entertaining, and enriching offers. All the latest must-haves in fashion, beauty, health and luxury at the most competitive prices will be easily accessible from various specially designated zones. Tickets are now available on 800tickets.com. Enter the magical Secret Garden, home of BRIDE Dubai’s Main Stage, located in the Bridal Zone, where fashion shows by the most sought-after designers, some making their debut this year, will unfold, along with workshops and demos by highly skilled consultants. There will also be a range of influencer and expert talks aiming to inspire visitors with real stories and useful tips, as well as special awards. In this area, guests can also witness the precision and artistry of local bakers as they decorate wedding cakes that will cater to various tastes. The International Fashion Avenueis set to present country pavilions from the UAE, the whole GCC, China, India, Italy, Poland, Romania, Turkey, USA, and UK. Expect to be impressed by the stunning selection of dresses for the entire wedding party and for a variety of special occasions, from popular exhibitorslike WM Wadha Mohammad and Dar Najd. For those searching for sparkling savings, the Jewellery Pavilion has a spectacular array of exquisite yet affordable jewels, from the likes of Olivia Burton – Rivoliand Yessayan Jewellery. The dedicated souk gives guests the chance to try before they buy and find which precious stones perfectly match their outfit. From rejuvenating pamper sessions to latest technologies and secrets that promise to bring out the glow in every bride and style-focused woman, the Beauty and Health Pavilionwill haveeveryone covered. Leading brands such as Bath & Body Works, Awad Al Qubaisi and Canadian Medical, along with many more, are sure to add their own unique touches of elegance and class to the pavilion. The extensive selection, from bridal fashion, evening wear, cakes, photography and videography to honeymoon packages, perfumes, beauty and dental services, and so much more make BRIDE Dubai 2019 the ideal place to shop with friends, find effortless style, and take advantage of special event deals and prices only availableonsite. BRIDE Dubai 2019 also gives visitors Meet-and-Greet opportunitieswith some of the region’s leading tastemakers who are currently blazing a trail in the world of fashion, beauty, health and luxury. Hugely popular influencers, such as Noha Nabil, bride-to-be Dana Al Tuwarish, Latifa Al Shamsi, Al ReemSaif, and FatmaHusam, will all be in attendance, offering their expert advice and tips with the goal of empowering women, especially brides, to make their wedding and life dreams a reality. GhadiSharfi Beauty are donating various gifts and discount vouchers. Be truly spoilt with all of this and more for just AED225 online (AED250 on the door). With Standard Ticket entry, guests receive access to the Main Stage, 15% off Tips and Toes services onsite and a Caffé Nero ‘Buy-One-Get-One-Free’ voucher at AED25 online (AED30 on the door). 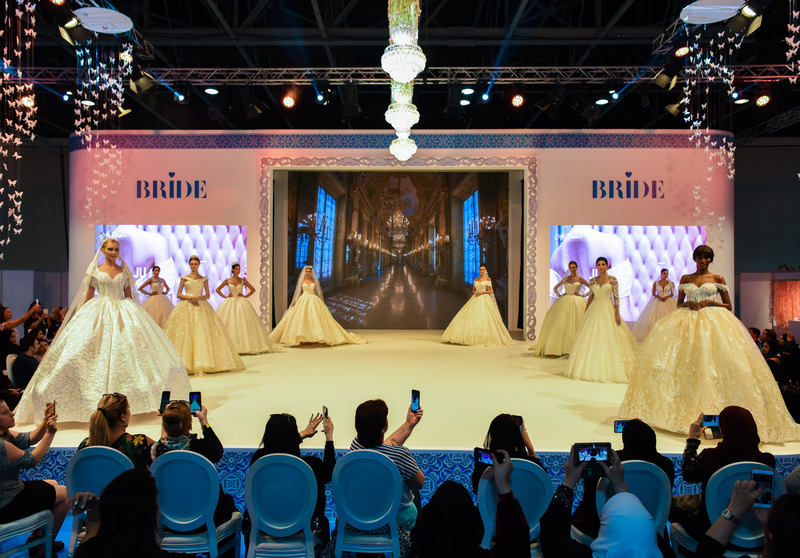 Get ready to enter the wonderful world of BRIDE Dubai 2019 from February 6 to 9. Doors open from 3:30pm to 10:30pm. Stay tuned for more updates across Instagram and Facebook @thebrideshoworvisit www.thebrideshow.com.